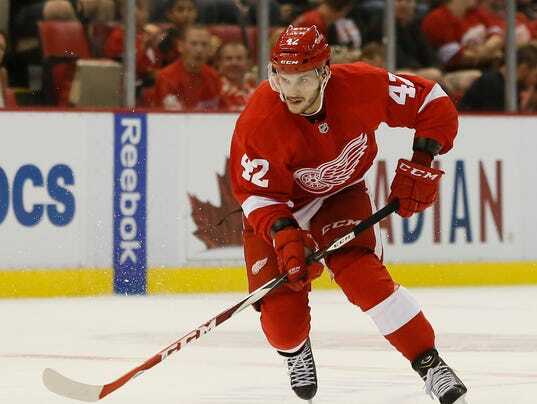 Martin Frk must make quite an impression come training camp if he wants to make the Detroit Red Wings lineup. Frk is coming off a Calder Cup championship, during which he played with a confidence earned after responding to being waived twice at the start of last season by producing 27 goals and 50 points in 65 regular-season games with Grand Rapids, adding another five goals and 15 points in 16 playoff games. Frk’s biggest asset is a blistering right-handed shot. He led the Griffins in the regular season with 12 power-play goals. Exhibition season is a great opportunity for coaches to audition players in varying roles because the outcome of the game does not matter – but to Frk’s disadvantage, the Wings, after having a dismal power play through the first half of the season, rebounded over the final 30 games with a power play (24.4%) that ranked sixth in the NHL. And the players who were on those two units all are returning – plus there is a good chance the Wings bring back Thomas Vanek in free agency, in which case he’d join one of the units. So, what about Frk’s chances? Blashill pointed to “chemistry and confidence” as the reason why the power play finally clicked.